Hi there! Do you know where the mugs came from???? me too I love those MUGS! A beverage station also can be as simple as 1, 2, 3. 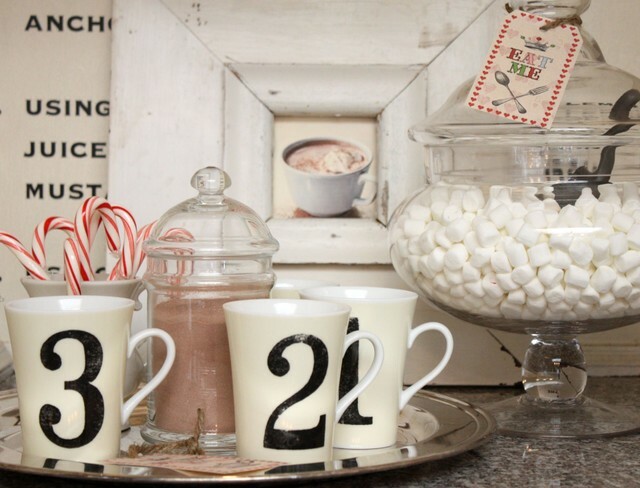 Stock a tray with some mugs, hot cocoa mix, candy canes and marshmallows. It will take up very little space yet still do the job. 15. Display favorite holiday ingredients. One of the simplest ways to add a bit of holiday fun to your kitchen is to round up ingredients for holiday treats and make them into a mini display. Decant cocoa powder and marshmallows into glass containers, fill a jar with candy canes or cinnamon sticks, and group your favorite mugs onto a nice tray.Tell us: What is your best time-saving decorating trick for the holidays? I know what some of you might be thinking: “All this work for kids? They should be running around outside.” Agreed, and we do plenty of that as well. The real reason I love to host my children’s friends in these intimate gatherings where they are the center of attention is so I can foster strong bonds with each child as they march together toward teenagehood. A wise mother once told me: Be the responsible party you want your children to attend. Don’t wait for someone else who may not care as much to take that role for you. Идею шоколадного вина я подсмотрела в мексиканском ресторане: их версия напитка была на базе черного шоколада с добавлением кайенского перца, корицы, мускатного ореха и (конечно же) шота текилы. Почему бы не последовать примеру мексиканцев? — Добавьте в сотейник палочку корицы или кайенский перец — может получиться интересно. Что еще учесть при приготовлении?